Jesus’ story of ten single ladies waiting for a wedding procession in the middle of the night seems strange to most westerners today. Here Jesus warns us that there are consequences for being unprepared. There are certain things you cannot acquire at the last moment. For example, students cannot prepare for their exams when the day of testing is already upon them. A person cannot get the right kind of character, strength, and skill necessary for a task at hand unless they already possess it, such as a captain with bravery and nautical skills who must steer a ship through an unsafe storm at sea. When the Lord Jesus comes to lead you to his heavenly banquet will you be ready to hear his voice and follow? Our eternal welfare depends on our hearing, and many have trained themselves to not hear. We will not be ready to meet the Lord, face to face, when he calls us on the Day of Judgment, unless we listen to him today. 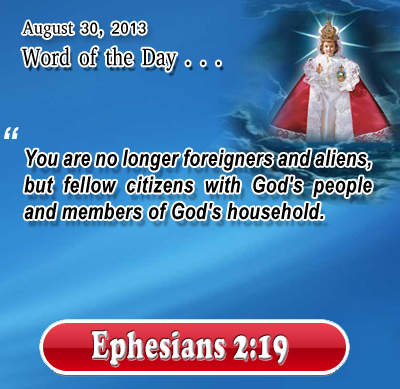 Ephesians 2:19 You are no longer foreigners and aliens, but fellow citizens with God's people and members of God's household. For the incredible and boundless love you have given to me, O Almighty God, we can only fall to our knees and thank you. Your power is beyond our comprehension. Your awesome holiness is beyond our understanding. Yet your infinite grace is ours because of your love which cost you so much. Thank you. A million times over we say it, "Thank you!" In the name of Infant Jesus our Lord. Amen. 1"Then the kingdom of heaven shall be compared to ten maidens who took their lamps and went to meet the bridegroom. 2 Five of them were foolish, and five were wise. 3 For when the foolish took their lamps, they took no oil with them; 4 but the wise took flasks of oil with their lamps. 5 As the bridegroom was delayed, they all slumbered and slept. 6 But at midnight there was a cry, `Behold, the bridegroom! Come out to meet him.' 7 Then all those maidens rose and trimmed their lamps. 8 And the foolish said to the wise, `Give us some of your oil, for our lamps are going out.' 9 But the wise replied, `Perhaps there will not be enough for us and for you; go rather to the dealers and buy for yourselves.' 10 And while they went to buy, the bridegroom came, and those who were ready went in with him to the marriage feast; and the door was shut. 11 Afterward the other maidens came also, saying, `Lord, lord, open to us.' 12 But he replied, `Truly, I say to you, I do not know you.' 13 Watch therefore, for you know neither the day nor the hour.